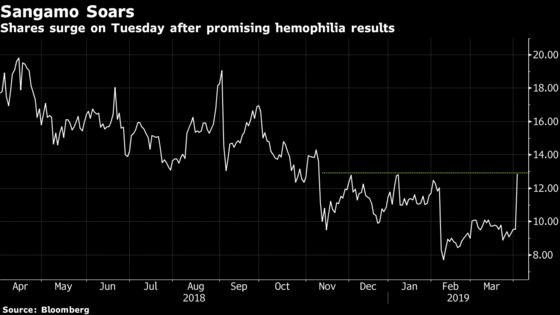 (Bloomberg) -- Sangamo Therapeutics Inc. soared after encouraging results from an early study of its hemophilia A gene therapy impressed bulls and quieted skeptics. The small-cap biotech and its partner Pfizer Inc. reported that patients receiving the medicine, known as SB-525, saw an increase in the blood-clotting protein factor VIII that topped some expectations. Six weeks after infusion, patients receiving the highest dose reached factor VIII levels that were 140 percent and 94 percent of normal, as measured by a clotting assay. Shares of the small-cap biotechnology jumped as much as 45 percent in early trading, the most intraday since May 2017, to touch the highest level in about five months. Pfizer shares traded incrementally higher after the update, and remain up more than 20 percent in the last year. “These interim results suggest that SB-525 may be well-tolerated and may prove to have the predictability and sustained treatment effect that can bring clinical benefit in patients with hemophilia A,” Sangamo chief medical officer Edward Conner said in a statement. Based on the results, a safety monitoring committee recommended the study to continue at the highest dose. The drugmakers plan to expand that dose group by up to five patients, with management saying on the call that they intend to start dosing patients in a timely fashion. Sangamo separately announced an agreement with Brammer Bio providing access to manufacturing. It also provided updates for studies of its medicines in diseases including Beta Thalassemia and in orphan diseases, including mucopolysaccharidosis type II and type I. Shares of the Richmond, California-based company suffered their worst session in a decade in early February when a pair of early-stage studies failed to demonstrate the benefit of two gene-editing medicines. The number of bearish bets against the stock have trended lower since those results, with short interest accounting for 13 percent of the shares available for trading, according to financial analytics firm S3 Partners.